Since being drafted by the Seattle Seahawks in the seventh round of the NFL Draft, Alex McGough ’17 has been busy in rookie camps and minicamps. 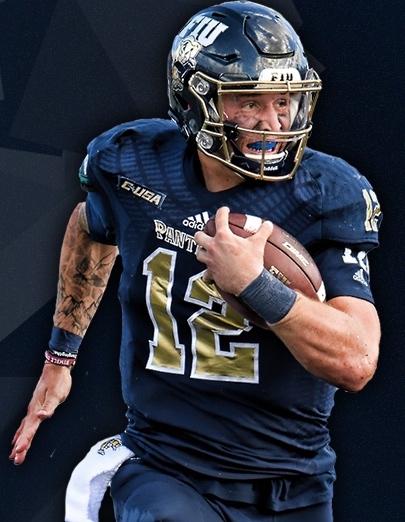 FIU News caught up with the former Panther quarterback to hear about his experience so far. The transition is so much learning and so much adjusting. You have to be yourself. You can’t try to be someone you’re not. You can’t try to do things you’ve never done before. The Seahawks liked what I did in college, so I’m just trying to do the same things I did in college here in the NFL and obviously learn from the veterans, take their coaching, apply it to my game and stay true to what I am and what I do. I usually get to the facility at 6:30 in the morning. Then it’s workouts or meetings at 8:30. After that it’s practice from 11:25 to 1:30, and then whether I worked out in the mornings or had meetings, I’d either go workout or go to meetings. Then I go back to the hotel and study the next day’s install until I go to sleep. And then I do it all over again the next day. Sounds like a lot of work. What’s the culture in the Seattle Seahawks organization like? They built a competitive culture here and you compete against yourself to be better than you were yesterday. It’s an organization that loves to win and builds the needs to win. It’s an environment where they want you to succeed, and so many things that they do give you such great opportunities to do it. I think [head coach] Pete Carroll and [general manager] John Snyder have built such a great culture here. The rookies see that the first couple of days they’re here, and they just want to follow along and grow. What was your reaction when you got drafted? Have you had any “aha” moments? I realized being around the rookies and the Russell Wilsons and the Pete Carolls and these huge-profile names that when it comes down to it, they’re humans and they just want to win. When they see that you can help them win, they’re going to treat you very fair and just like another person who’s there to win. What’s it like working with Russell Wilson? It’s great. He’s a great guy and an excellent quarterback. I’m just learning on the field and off the field how he acts and how he leads the team. There’s so many aspects of his game that I want to learn from and I just want to get better learning under him and playing next to him. I’ve seen that the culture in Seattle focuses on mindfulness. Can you tell me about that? Yeah. We have a sports psychologist here. He spoke in the team meetings and rookie transition meetings. He said you can train your mind, your craft and your body. Those are three things that they’re teaching us. But the culture that I’ve seen is a competitive culture and they just thrive off of competing and getting better.